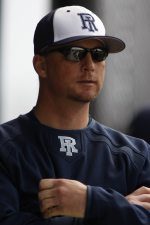 KINGSTON, R.I. – The Rhode Island baseball program has released its 2010 schedule, which is highlighted by a trip to Virginia for a three-game series against the Cavaliers, who participated in the 2009 College World Series. home runs and fielding percentage – the 2010 squad will look to pick up where it left off, returning all but three starters (two pitchers, one infielder) from a year ago. Rhody opens the new season with a three-game series at Mississippi State (Feb. 19-21) before heading to Charlottesville, Va. for three games against the Virginia Cavaliers. The Rams will spend March 6-11 in Winter Haven, Fla., facing various opponents who have yet to be determined. URI then travels to UNC Wilmington for a three-game series beginning on Friday, March 19. From there, Rhody will travel to William and Mary for a pair of games on the 23rd and 24th. The Atlantic 10 portion of the schedule will feature home series against Charlotte (April 9-11), Massachusetts (April 16-18), Xavier (April 23-25), Richmond (May 14-16), and George Washington (May 20-22). The Rams will travel to play three-game conference series at Temple (March 26-28), Fordham (April 1-3), Duquesne (April 30-May 2), and St. Bonaventure (May 7-9). The Ram’s non-conference home schedule features games against Central Connecticut (March 30), Boston College (March 31), Quinnipiac (April 13), Bryant (April 14), Brown (April 27), Siena (April 28) and Northeastern (May 19). Rhode Island will also face Northeastern (April 7), Sacred Heart (April 20) and Connecticut (April 21) on the road. Atlantic 10 action will wrap up at the league’s 2010 Championship at Campbell’s Field in Camden, N.J., from May 26-29.